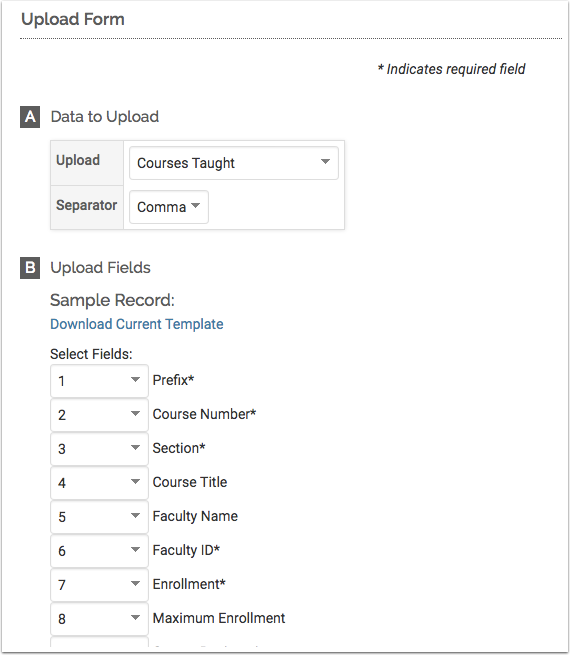 When uploading data to FACULTY180, the Upload Form must be used if the indirect method of data transfer is being utilized. Once the Upload Form is configured, use the Upload Data feature to actually upload your institution's data. Select the type of template to be configured using the Upload list in the Data to Upload section. Note that the fields in the Upload Fields section vary based on the type of template being configured. Select the separator that is used in the data being uploaded from your institutional system (comma or tab). Use the Select Fields section to select the fields corresponding to the data being uploaded. The order of the fields selected must correspond with the column order in the uploaded data file. See the Data Dictionary for detailed information about the available fields within each file type.